One night only, Portlanders! Tonight at 7:00 at the Hollywood Theatre, I’ll give my talk and screening “Portland and Los Angeles: The Cities in Cinema“, a look at how movies — respectable ones and schlockfests, Hollywood blockbusters and indie favorites, visions of the future and the past — reveal both the City of Angels and the City of Roses. 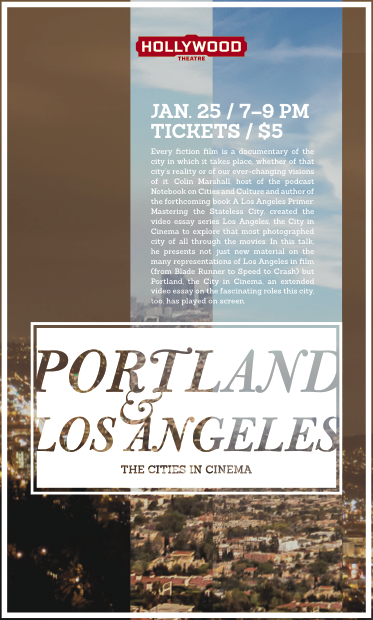 It’ll involve never-before-seen “The City in Cinema” video essays as well as the world premiere of the long-form “Portland: The City in Cinema”. Reliable sources have also informed me that Q&As at the Hollywood usually extend to the dive bar across the street afterward, so rest assured that beers will be imbibed. You can get tickets and more details here. This was written by Colin Marshall. Posted on Sunday, January 25, 2015, at 8:40 am. Filed under events, Portland, The City in Cinema. Bookmark the permalink. Follow comments here with the RSS feed. Comments are closed, but you can leave a trackback.